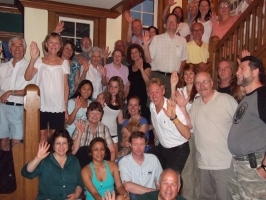 The Tuesday night group has been in existence for decades. There are two groups that meet simultaneously, one for adults and one for children. The adult group is generally reading from the Jesus papers. The group prays, talks, shares, reads, and has dessert. We hold an annual Christmas party and sometimes have Remembrance Suppers. Most nights 15-30 people attend the adult group. Andre Radadus, Paula Thompson, Jim Downs, and Mo Siegel rotate weekly leadership of the group. The kids group reads the Jesus Papers as well. They talk, share, read, go for ice cream, have retreats, have fun, and grow up together. Jennifer Siegel teaches class to the kids. If you wish to zoom into the Tuesday night group at 7pm MST, the meeting number is 303-447-0212.